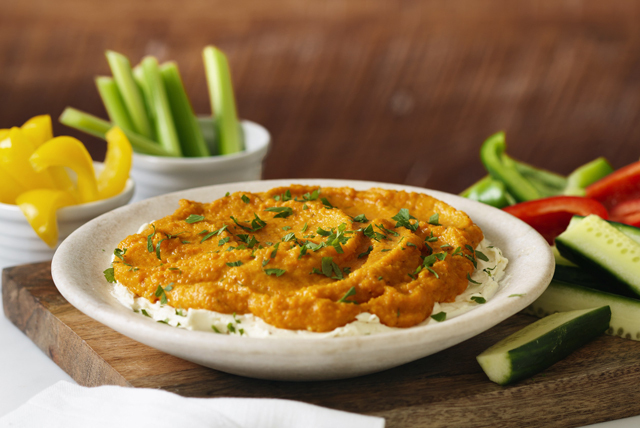 Transform a bag of baby carrots into this delicious layered dip. Start with a layer of creamy feta and PHILLY Cream Cheese, then top with a delicious carrot pesto. It's sure to be a hit at your next get-together with family or friends. Cook carrots in boiling water in large saucepan on medium heat 12 to 14 min. or until tender; drain. Cool. Mix cream cheese and feta until blended; spread onto bottom of pie plate. Process carrots and remaining ingredients in food processor until smooth. Spoon over cream cheese mixture. Serve with your favourite cut-up fresh vegetables, such as red, yellow and green pepper strips; sliced cucumbers; and/or celery sticks. The carrot pesto can be prepared ahead of time. Refrigerate up to 2 days before using as directed. For added convenience, the complete dip recipe can be refrigerated up to 24 hours before serving.